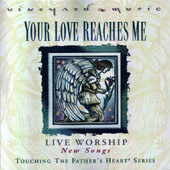 Your Love Reaches Me: Vineyard Music EXTRA! Your Love Reaches Me is the latest release from Vineyard Music Groups Touching The Fathers Heart series and is unlike any other previous worship recording. Documenting a bolder approach to worship, this album encourages the listener to engage in an energetic and spirit-filled worship that is both powerful and dynamic. Recorded live during The Burn Service at 5 Cities Vineyard on the Central coast of California, Your Love Reaches Me features Darren Clarke, Ryan Delmore and Jesse Lane who team up in songwriting, musicianship and worship leading resulting in this innovative collection of new songs. Clarke, Delmore and Lane minister weekly to a congregation mostly dominated by those who range from ages 18 to 30. Both Clarke and Lane hail from the south of England while Delmore is a southern California native. Each worship leader expresses a desire to spur the body of Christ to a firmer commitment of living the gospel as well as sharing it. Your Love Reaches Me will deeply minister to the youth and the young at heart. It is worship that is inspiring and passionate, leading worshippers before the throne of God and ministering to the hearts that seek to know Him more.